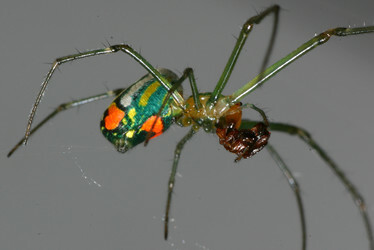 Leucaugines are a very species-rich group which includes some of the most beautiful tetragnathid spiders. Many leucaugines are relatively large and have vivid colors and reflective silvery abdominal patterns. Leucaugines are most diverse in the tropics but some genera have representatives in the temperate zones. 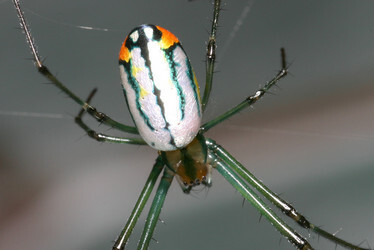 Some leucaugines are very common and well known, such as the orchard spider (Leucauge venusta), a species widely distributed in the Americas. 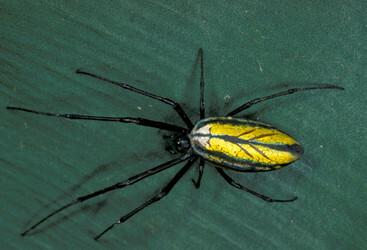 The subfamily Leucauginae was created by Caporiacco (1955) to include four Leucauge species from Venezuela. Leucaugines have traditionally been included within the “metine’’ tetragnathid lineages. All leucaugines have two rows of long feathered trichobothria on the leg femora which often can be seen with the naked eye. Males are usually almost the same size as females and, unlike in other tetragnathids, cheliceral sexual dimorphism is not conspicuous. In addition, the male pedipalps of leucaugines have a dorso-basal cymbial process and a mesally displaced tegulum. The embolus has a large base, at least twice longer than wide, and the sperm duct path is complex with more than two coils. 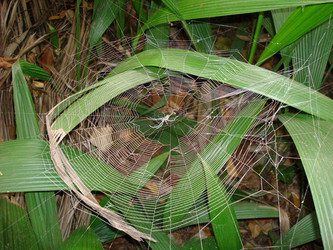 Most leucaugines build two-dimensional orb-webs that can vary considerably in the number of spiral turns and radii even between individuals of the same species. 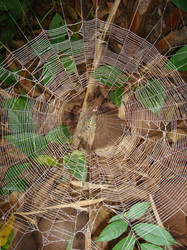 In some Leucauge species the webs have a tree dimensional barrier structure. Several cladistic analyses have corroborated the monophyly of leucaugines (Álvarez-Padilla, 2007; Álvarez-Padilla et al., 2009; Dimitrov and Hormiga, 2009; Tanikawa, 2001). The tree presented here is based on the morphological and molecular analysis of Álvarez-Padilla et al. (2009). The following tetragnathid genera have at lest some of the synapomorphies of Leucauginae (but not have been included in any analyses): Alcimosphenus, Atelidea, Mecynometa, Okileucauge, Opas and Pickardinella. These genera are listed here as incertae sedis. Caporiacco L.di. 1955. Estudios sobre los arácnidos de Venezuela. 2a parte: Araneae. Acta Biol. Venez. 1: 265–448. Tanikawa A. 2001. Okileucauge sasakii, a new genus and species of spider from Okinawajima Island, southwest Japan (Araneae, Tetragnathidae). 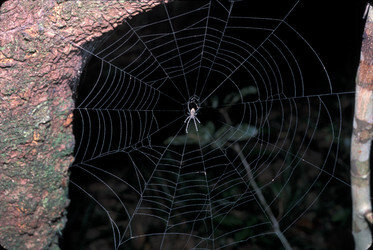 J. Arachnol. 29: 16–20. Page: Tree of Life Leucaugines. Authored by Dimitar Dimitrov and Gustavo Hormiga. The TEXT of this page is licensed under the Creative Commons Attribution-NonCommercial License - Version 3.0. Note that images and other media featured on this page are each governed by their own license, and they may or may not be available for reuse. Click on an image or a media link to access the media data window, which provides the relevant licensing information. For the general terms and conditions of ToL material reuse and redistribution, please see the Tree of Life Copyright Policies.